With the World Cup taking place, and soccer being the sport to watch these days, Enslow's book, Soccer Skills, teaches the basics of soccer, using action shots of professional players. This 48 page title, written for the reluctant reader, discusses dribbling, passing, heading, styles of defense, throw-ins, corners and direct kicks, defending a shot while goalkeeping, and many more topics. There is also a diagram listing the different positions and where they are on the field in relation to their teammates. This title, and the other five titles in the How to Play Like a Pro series, are correlated to the Common Core College and Career Readiness Anchor Standards. The other books in the series cover baseball, basketball, cheerleading, football, and hockey. All of these titles are available from your preferred vendor, local bookstores, enslow.com, Amazon, and Barnes and Noble. issue of School Library Journal. This series is correlated to the Common Core College and Career Readiness Standards, and is available in library, paperback, and eBook formats. These titles are available from your preferred vendor, local bookstore, Amazon, and Barnes and Noble. Enslow's new series, Be Smart About Money and Financial Literacy. Written for the middle school reader, each of these six books cover one topic related to money and financial literacy. Be Smart About Credit, the first title in the series, defines the two ways of looking at debt; the kinds of credit and debt; the costs of credit and debt; what are credit ratings and reports; knowing rights and responsibilities; and troubleshooting tools. The end of each chapter features a math or word problem. All six titles in the series are available in library, paperback, and eBook formats. There is also a library/eBook bundle. These titles are available from your preferred vendor, local bookstores, Amazon, and Barnes and Noble. This series is also correlated to the Common Core College and Career Readiness Anchor Standards. Visit http://www.enslow.com/series/True_Stories_of_Teens_in_the_Holocaust to find Common Core correlations and other information on the series. Pure Poetry, geared toward the upper middle and high school student, is a series of four titles, with each book focusing on one particular poetry theme. Each chapter looks at one poem accompanied by detailed analysis discussing the style and technique, poetic devices, and the cultural significance. Every chapter ends with questions and prompts for student discussion and assessment. These titles are correlated to the Common Core College and Career Readiness Anchor Standards, and are available in library, paperback, and eBook formats. They are available from your preferred vendor, enslow.com, local independent bookstores, Amazon, and Barnes and Noble. Enslow has just published two new math series, one geared toward the elementary reader and the other toward the middle school reader. Ready for Math, a series for the upper elementary reader, contains six titles, each of which focuses on a different math topic. The clear and inviting design includes many practice problems to aid the student when reviewing math skills. Easy Genius Math, written for the middle school student, also focuses on one title per math topic, with six books in the series. They are an excellent review or refresher of math skills, and can be used by parents or tutors trying to help the struggling math student. Both series are available in library, paperback, and eBook formats. They can be ordered from your preferred vendor, local bookstore, Amazon, and Barnes and Noble. who invented the windshield wipers that allow drivers to see in those bad conditions? Before the invention of the windshield, drivers had to wear goggles to keep rain, snow, and bugs out of their eyes while driving. The first windshield, invented in 1904, could be folded down in case it became so dirty that drivers could not see through it. The other option was to pull over and try to clean the glass with your hand. Some drivers even tried rubbing an onion or carrot on the windshield, thinking that the oil from these vegetables would leave a film on the windshield, and repel the rain. That did not work either. This 48 page book, written for the upper elementary reader, describes how Mary Anderson came up with her idea, what steps she took to try to patent the idea, and what happened after she allowed the patent to expire. Available in library, paperback, and eBook formats, this title is part of the Inventors at Work! series. This series is correlated to the Common Core College and Career Readiness Anchor Standards. Other inventors in this series include Ruth Wakefield, Willis Haviland Carrier, Percy Spencer, and Jacques Cousteau. These titles are available from your preferred vendor, local bookstore, enslow.com, Amazon, and Barnes and Noble. 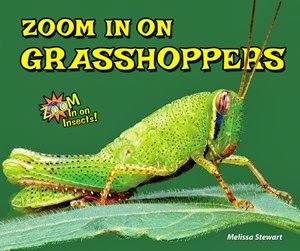 Author Melissa Stewart lets readers take a close look at grasshoppers in this title in the Zoom In on Insects! series. Use the 'Zoom In' bubbles to get an up close look at a grasshopper’s eyes, wings, antennae, and more! Available in Library binding, paperback, and eBook from Enslow Publishers, Inc.
Two subjects from our African-American Icons series performed the opening number on the Grammy awards last night. Beyoncé and Jay-Z are two of the titles in this series. Written for the middle school reader, these 100+ page titles are great for those who want to learn more about these current actors, singers/musicians, authors, and comedians. Other spring 2014 titles in this series include biographies about Chris Rock, Jennifer Hudson, Sean "Diddy" Combs, and Tyler Perry. There are also six titles published in spring 2013. All of these titles are available from your preferred vendor, local bookstore, enslow.com, Amazon, and Barnes and Noble. These titles have been correlated to the Common Core, and are available in library, paperback, and eBook formats.